Kubernetes (AKS) can be used for many situations. For a client we needed to make files available trough a Kubernetes Pod. The files needed to be shared between containers, nodes and pods. Files can be made read-only for a Pod. Files can be added via a Windows Network drive. To prove the scenario worked we used a simple “html” file when we opened the external endpoint. The container type we used within Kubernetes is “httpd” which is a container with a simple apache web server. (https://hub.docker.com/_/httpd/). For the file share we choose “Azure Files”. With Azure Files we can share a File Share with the Kubernetes Pods and Windows devices. For this you need to create an Azure Storage account. Navigate to the Azure Portal (https://portal.azure.com). Click “Create a resource” and search for “storage account”. Choose “Storage account – blob, file, table, queue”. Fill in the correct properties and click on “Create”. 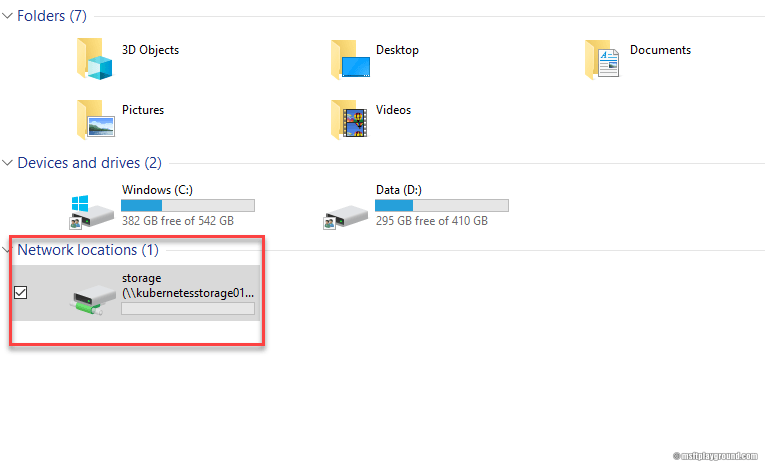 When the storage account is created open the resource and click on “Files”. In the Azure Files blade create a new “File share”. 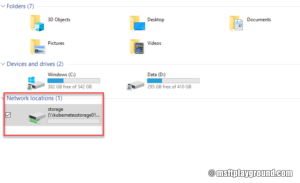 With the Azure File Share created you can connect it to your windows machine. Click on the file share in the Azure File blade. In the connect blade it will present the PowerShell script that you can run on your environment to attach the file share. Adding the secrets Kubernetes can be done via a yaml file or the kubectl command line. When using the yaml option encode the properties in base64. You can google for an online solution. I used: https://www.base64encode.net/ for example. For getting the container up and running we create a Kubernetes deployment that runs the container. The mountPath is the starting point for the apache web server meaning that everything that is placed on the file share will be exposed by the pod. To get it externally available we have to take one more step. That step is configuring a Kubernetes service of the type “LoadBalancer”. Opening the IP in the browser will result in an empty page. Uploading the sample html file named “index.html” will have the expected result.